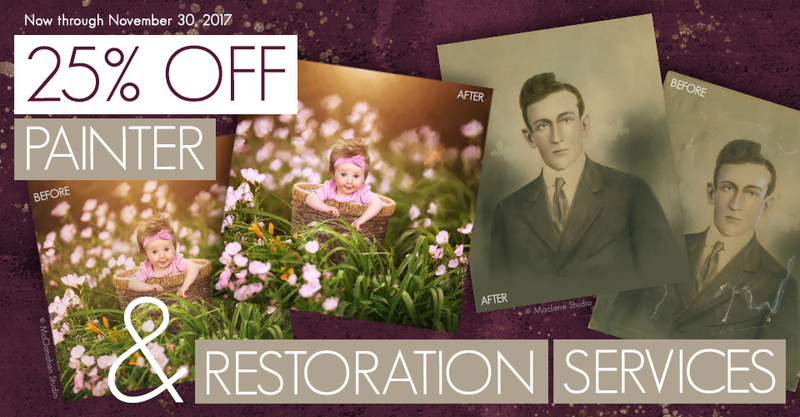 From restoring damaged photographs to transforming images into gorgeous digital paintings, we have a skilled team of artists ready to lighten your workload. Commission Miller’s Art Department to help you with your most challenging editing projects and enjoy 25% off. Offer expires November 30th. I am looking to have some new prints made (along with the digital file) from some old photos that were from the 50’s. Can you let me know how this process works? Thanks! Hi Katy. Yes, we can definitely help with that. Please email Carrie Wilson, the coordinator of our Art Department, at carriew@millerslab.com for more information on the process.